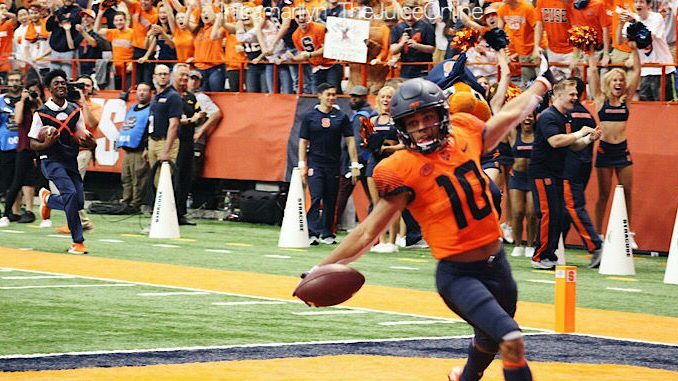 Sean Riley runs into the endzone after a 69-yard punt return for touchdown during Syracuse's 51-21 win over UCONN. Mandatory Photo Credit: Initra Marilyn, The Juice Online. Stephen Bailey: All signs point to that they’ll have another opportunity to take a step forward next year. The depth across the board has been the best it’s been through three plus years of the Dino Babers era, and the schedule is the most forgiving since Syracuse joined the ACC in 2013. That said, spring has not gone great for Syracuse. There have been a lot of injuries. […] There’s been a lot of phsyical contact this spring and it seems like the team’s gotten more injuries this spring than they did last fall. It doesn’t look like anyone is in danger of missing the fall, but I’m sure Dino Babers would prefer to have his whole complement of players scrimmaging, but he certainly does not. 3. How does Tommy DeVito look? 8. Can Syracuse compete for a national championship?